In 2012, I was lucky enough to attend a remarkable weekend-long Class Action Train-the-Trainers mega-workshop. I did not attend to learn techniques to raise awareness about class and classism but instead to improve my skills as a trainer on the topic of communications and marketing. While the focus of the Class Action workshop was, of course, on social class issues, I had been told by other trainers that the weekend session was also a way to incorporate popular education techniques into my workshops. Little did I know when I signed up for the training that it would inspire me to not only provide facilitation for Class Action but to help create a national organization dedicated to making a centuries-old faith community more class-inclusive. During the training, I reconnected with a colleague I’d known during my years at the Unitarian Universalist Service Committee (UUSC), an international human rights and social justice organization started by the UU denomination. While not a UU at the time, I was drawn to the UU Association’s commitment to social justice – and to its choice to hold to no particular creed but to affirm and promote seven principles, which members hold as strong values and moral guides. Like me, the Rev. Dr. Dorothy Emerson was attending the weekend to glean facilitation skills to use in her training. Like me also, she was so inspired that part way through the weekend, she decided she wanted to incorporate what she was learning about class and classism into her work. And it was during lunch the second day that we decided to bring the “good news” of class inclusion to the Unitarian Universalist faith community. Class Action board chair (then program director) Betsy Leondar-Wright joined our effort shortly thereafter. While the Unitarian Universalist denomination is considered to be one of the most progressive faith communities in the United States, it is also one of the most class-advantaged. This dichotomy can make for some complicated behaviors and feelings around class diversity. Too many UUs from less class-advantaged backgrounds feel embarrassed by their lack of a degree(s), never mention what they do for a living or feel deeply humiliated during church canvas time (the annual pledge drive). They are also frustrated by other members’ disregard for the cost of activities or insistence on scheduling meetings only during weekends and evenings when shift workers cannot attend. UUs with more class advantage are often unaware of the classism imbued in the canvas, auction, capital campaign, staid music, Sunday-morning discussions about work accomplishments or kids in college, and even locations in suburbs with no public transportation. But there seemed no substantive way to bridge the class divide within congregations and organizations. Often less class-advantaged members left in frustration. Additionally, potential members – people searching for a progressive community in the midst of a growing ultra-conservatism and white supremacist resurgence – were sometimes put off by the upper-middle-class organizational culture of many UU congregations. And that is where UU Class Conversations comes in. We offer a way for people to begin to share their class experiences through shared language. Then we help them deepen their understanding of the role that class plays in shaping their worldview. 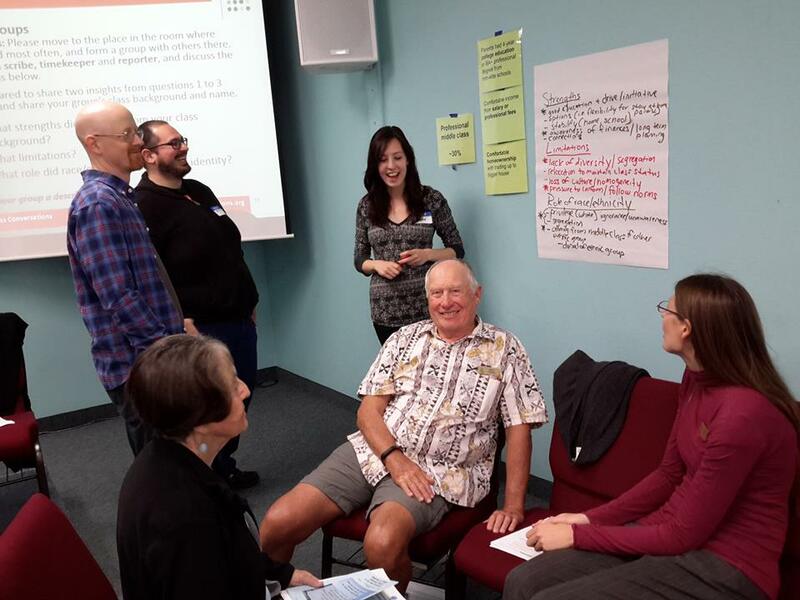 Then we help them create an action plan to address classism within and outside of their UU congregation or organization – to create authentic community. And what is the catalyst for connecting with UU Class conversations? Despite class differences, most UUs understand that inequality is growing between the very rich and the rest of us. And as Unitarian Universalists, they know that to remain true to the seven Principles, they need to engage in work to address the escalating inequality. UU Class Conversations uses this knowledge as an opening to help people understand that part of this work is engaging in a process to explore social class and address classism together. We provide workshops, consultation and resources to help UU institutions become class-aware and class-inclusive. We believe that this is deeply spiritual work. Since our founding in 2013, we have helped 1000s of UU congregations, organizations and individuals from across the United States – from New Hampshire to Washington state and from Arizona to Michigan – discover the gifts they bring from their class background, bridge class differences, and begin to build more class-aware, class-inclusive faith communities. UU Class Conversations is independent, receiving initial seed funding from the UU Funding Program, which has continued to provide a large part of our funds. We have received grants and sponsorship from other UU organizations and raised monies through the crowd-funding source Faithify. We have a loyal group of donors as well. Become familiar with the concepts of class and classism. Engage in self-reflection on individual class backgrounds and learned attitudes and behaviors. Consider policies and practices that benefit more affluent people and communities at the expense of others. Examine the rationale and culture that supports these systems and the widening wealth and income gap over the past 30 years. Celebrate class diversity and the strengths and challenges inherent in each group’s experience. We believe this is a model that can and should be replicated by other faith communities. It is making a clear difference for Unitarian Universalists across the United States and at the denominational level also. Thanks, Denise, for sharing “our” story. I hope if other groups pick up on this process as a potential model, they will let us know how things go. Maybe we can help them get started.